Ms J's Chemistry Class: Solutions, Suspensions, and Colloids... Oh My! Today we started with a math jump in reviewing specific heat and heat conversions we learned on Friday. We got through it, but we will be practicing again tomorrow. Today in notes we started with discussing solutions, suspensions and colloids. Solutions are homogeneous well-mixed mixtures that cannot be separated easily (a change in phase) - like kool-aid or saltwater. Suspensions will settle and separate over time because of gravity or because of differences in density - like oil and water or orange juice with pulp. 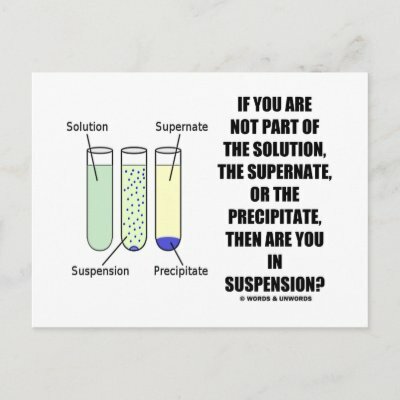 Suspensions are heterogeneous. Colloids are weird. Colloids should settle and separate over time but because the particles are super-tiny just running into each other (Brownian motion) keeps them in suspension. Colloids can also represent two different phases so if it seems weird like you cannot classify it as just one phase - like fog, jello, whipped cream - it's a colloid. Next we discussed colligative properties. If you add solute to a solution, like salt to water, it changes the properties of the solution, particularly the boiling point or freezing point. We put salt on the roads to lower the freezing point of water so ice does not form on the roads. Electrolytes can conduct electricity because the solute breaks up into ions and the ions can carry the electric current. Pure water does not conduct electricity - but water with solutes in it can. We did an in-class demo similar to this one to test some solutions. Salt water does conduct electricity, but sugar water does not because of the carbon. Gatorade conducts electricity but barely because of the high sugar amount in the drink. Finally we talked about Molarity. Molarity is moles/Liters and is a quantitative way to measure concentration. Molarity descirbes with numbers if a solution is dilute or concentrated. It is a pretty easy formula so students zoomed through it. Molarity changes with the amount of solute OR the amount of solvent (liquid) so we will be discussing dilutions tomorrow. In some classes we got to the team challenge on solutions, suspensions, and colloids, and in some classes we did not, so we will finish that up tomorrow. Benchmark Tuesday covering units 1 and 2.